You’re not going to believe this. I am actually writing a post about garlic. Again. I know. It seems a bit ridiculous. But hear me out. While I love green garlic, this is truly something special. Most people haven’t heard of it. And I’ll admit – I was a little skeptical. I mean look – it doesn’t even look like garlic! Garlic scapes are the curly, green stalks of garlic plants. When they’re young, the tops sort of look like tightly closed flower buds. They’re harvested so the garlic plant can use all its energy for the bulbs. You won’t find these babies in a supermarket, they can only be found at farmer’s markets and the season is super short. Usually you can find them in late spring or early summer. And once they’re gone, they’re gone. Better luck next year. Ok, so how do they taste? You are in for a real treat! They’re mild, slightly sweet with a hint of distinct garlic – sort of reminds me of a cross between scallions and green garlic. They’re versatile – can be eaten raw or cooked and can be used just like garlic in recipes. While there really isn’t a wrong way use garlic scapes, my favorite way is to eat them is raw. When raw, they’re crunchy and aromatic and oh so good! I think I’ve topped off just about anything you can think of with my garlic scapes – eggs, fish, pasta – just to name a few. I won’t bore you with all my nutrition talk about garlic scapes. They do come from garlic so they are nutritionally the same. We’ve had this conversation before. You remember. Garlic – the antioxidant superhero fighting free radicals. No? Well you can read all about it here. But did you know that garlic was also once considered a wonder drug? Didn’t think so. Back in ancient times, garlic was used as a remedy for various epidemics such as dysentery, cholera, and typhus. In fact, garlic was the go-to cure for any epidemic that emerged. Pretty something, huh? See I told you – superhero. So do yourself a favor – take a little time to visit a farmer’s market and treat yourself to the goodness of garlic scapes. You’ll wonder how you ever got by without them. 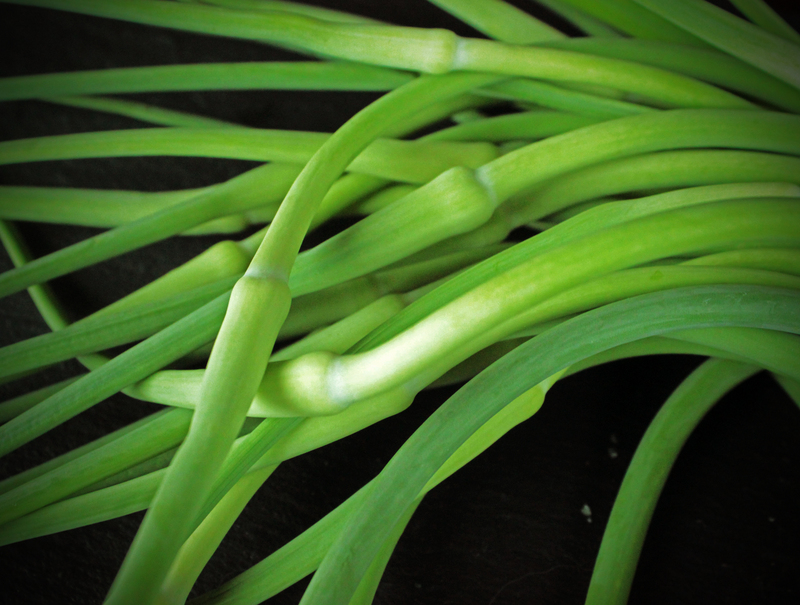 Have you been lucky enough to experience garlic scapes? How do you like them? Want more ideas on what to do with garlic scapes? Check out this page! In a bowl, mix eggs with buttermilk and set aside. Add olive oil to hot pan and then add the onion, garlic and ginger. Stir and let cook a minute or two, be careful not to burn. Add red pepper and broccoli slaw. Cook until the vegetables are soft, about 5 minutes. Meanwhile mix the soy sauce, oyster sauce and red pepper together in a bowl. Once the vegetables are cooked move them over to one side of the pan. On the side that does not have the vegetables, pour in the eggs and scramble in the pan. As the eggs start to cook, mix together with the vegetables. Once the eggs are cooked, add in the chilled cooked rice. (You may need to add a little bit more olive oil so it doesn't stick.) Mix the rice into the eggs and vegetables and then press the mixture into the bottom of the pan with a spatula. Cook a few minutes until the rice starts to brown a bit. Continue to mix and press into the bottom of the pan until all the rice is brown and a bit crunchy. Add the soy sauce mixture and mix thoroughly. Divide the "fried" rice into bowls and top with garlic scapes. You can use any leftover rice for this dish. It's important the rice is chilled so it "fries" properly. If you don't have buttermilk on hand, you can use milk.